This old faithf­ul struct­ure is too “out of sight” to claim any meanin­gful share of the meagre mainte­nance pie. In the year 1916, the British Government of India, commissioned the “Lightship Sindhi” that was to be one of its most trusted and useful lightships. Lightships, as the name suggests, are ships with huge lights that guide maritime traffic. Unlike lighthouses, they can be shifted from one place to another and were often stationed in places where it was difficult to construct lighthouses. However, with the advancement in construction techniques and the innovation of unmanned lighthouses and light-buoys, lightships are fast becoming obsolete. Most of the remaining lightships of the world are maintained purely for their historical and novelty value rather than for their maritime utility. But back in 1916, the Lightship Sindhi was a welcome addition to British India’s maritime assets. Built at the Royal Indian Marine Dockyard in Bombay, she was meant to serve off the coast of Sindh. During World War I, she served off the Iranian island of Qais and was very valuable to maritime traffic. After the war, she was stationed off what was then known as the Hajamrao creek in the Indus Delta region. Her light is said to have been visible at a distance of 10 miles. Had she been serving in the same area today, perhaps there would have been fewer Pakistani fishermen languishing in Indian jails and vice versa! Pakistan inherited the vessel after partition and its duties were invaluable in the development of the port of Chalna on the Passur River in what was then East Pakistan. In retrospect, if such development work in Pakistan’s eastern wing had continued, the sense of deprivation felt by the Bengalis may have been reduced and history may have played out very differently. Alas, that was not to be, and the Light Ship Sindhi, along with other craft, were once again summoned to West Pakistan. I developed an interest in the vessel after coming across an old photograph of the vessel in the British Library archives. However, despite my interest, I could not trace the ultimate fate and present-day whereabouts of Lightship Sindhi. Unlike old soldiers, old ships don’t just fade away. Some end up in Davy Jones’ locker while others are tugged into ship breaking yards like our very own Gadani to be broken down. Some are luckier and become “museum ships” that remain afloat for many years after being decommissioning. Lightship Sindhi, however, seemed to have disappeared into the red tape Bermuda Triangle of government records, faded memories and other priorities. As luck would have it, a recent camping trip with friends took us to a tucked away corner on Sindh’s land mass called Cape Monze, where stands what was once the “most westerly lighthouse in India”. “Ras Mauri” is the name that was given to the point by Arab cartographers. In Arabic “Ras” is a pointed land mass jutting out to sea — or simply put — a cape. An example is the emirate, Ras Al-Khaima in the UAE. Over time, with the inter-play of British and Arab cartography, Ras Mauri became Cape Monze, though it is still referred to by its Arab name in some maritime maps. Today, not many in the nearby Karachi know about the graceful lighthouse, which is fondly called the “Batti” by the fishermen who use it for finding their way in the sea at night. It was commissioned in 1914 at a cost of Rs 157,894 and constructed by the Public Works Department of the Government of Bombay. It has braved many storms and guided countless ships to safety over a period of almost a century. At 158 feet it is easily the tallest lighthouse in Pakistan — but is often denied that distinction as this information is not widely available. Unlike the Manora lighthouse, the Cape Monze lighthouse is not visible from Karachi or even from its popular beaches. In this case, out of sight is truly out of mind. To use another cliché, time truly seems to have stood still here, and even in this day and age, cell phone coverage is not available. But for the locals at least, the memory of the lighthouse has not faded. A descendant of one of the workers told me that the materials for the lighthouse were brought on camels to this remote location. Amazingly to this day, water and provisions for the staff manning the lighthouse are still brought on camels! We were originally supposed to enjoy an off-road drive to the lighthouse, but being unable to find a car, we had to trek across five kilometres of rocky terrain to get there. The bonfire by the seemingly haunted “resthouse” under a starry sky and the revolving light-beams of the lighthouse was an experience to cherish for a lifetime. In the morning, our group made its way up the painfully steep and seemingly endless flights of steps spiralling to the light at the top. As one climbs up, the tower gets narrower and narrower inducing claustrophobia combined with a shortness of breath that makes you feel as if you are drowning — admittedly the condition is worsened if one is over-weight and has smoked heavily for a decade! The laborious climb was not in vain as it afforded a unique opportunity to experience a walk through a “living museum” of sorts. The Burma teak, wrought iron railing, stone masonry and iron platforms on each floor, are nothing short of living history itself. The light apparatus is no surprise, as it has a Hyperradiant Fresnel Lens made by Chance Brothers of Britain and a manual wind-up mechanism to make it revolve, as it floats on a mercury chamber — very similar to the Manora Lighthouse. The real surprise lay came when I went out on the balcony to take in the breathtaking view of the rocky beaches and small cliffs on either side of the lighthouse. Once I got over the initial awe of the view, I ventured to circle around the balcony and found one of my friends busy cleaning a brass bell which hung from a ledge. As I came around it, I could not believe my eyes. 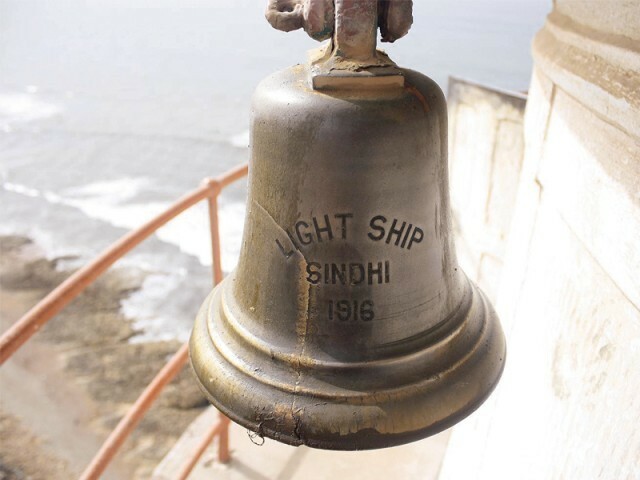 Lo and behold — engraved on the weathered but shiny bell were the letters “Light Ship Sindhi 1916”. I had found her or what remained of her, at last! No other podium would have been high enough and more under the spotlight after the bright career of Lightship Sindhi. Decades after its decommissioning, its bell, the de-facto birth certificate of vessels in days of yore, still hangs at its contemporary, the Cape Monze Lighthouse on the western most tip of Sindh’s shoreline at the point of Ras Mauri. This then is the final resting place of the Lightship Sindhi, or part of it, at least. But what happened to the ship itself? It turns out that the Mercantile Marine Department, which manages the Cape Monze Lighthouse, inherited the Lightship. With the construction of various beacons along the Pakistani coast, the ageing ship was no longer required and was decommissioned and its staff and moveable assets were administratively merged with the Cape Monze Lighthouse. The Maritime Museum of Pakistan did not exist at that time and hence the vessel, is ‘thought’ to have been sent for scrapping. The Cape Monze Lighthouse itself has served for 98 years and its masonry is now crumbling at various points, exposing the inner metal supports. It is said that despite a hefty fee charged from vessels for usage of navigational infrastructure such as lighthouses, a meagre maintenance budget is allocated for all the installations dotting the Pakistani coast. This old faithful structure is too “out of sight” to claim any meaningful share of the meagre maintenance pie. I dread to find, on a future visit, a “shattered visage” lying unceremoniously like Shelley’s Ozymandias, boasting of a glorious past, an apathetic present, and a future that is anything but bright. Over half a dozen vehicles will pass through nine districts in Sindh and 11 in Punjab. Experts say this has depleted mangrove forests and caused seawater to surge inland. Mr. Mulki: What an admirable job you have done to bring to bear your light on-perhaps the last resting place ( or one of its last remaining “assets” ) the Brass Bell that says “I once belonged to the : ” Light House Sindhi” …looking at it I could almost hear an echo from the “Bridge” of a Mariner announcing ” Light House Abeam!”. What a marvellous story. Thank you for taking one on this nostalgic journey. May your tribe increase. I wonder if you have have discovered other such maritime related gems. You might care to uncover the mystery of another treasure …a River Vessel …that once sailed the River Indus and now lies somewhere near Panjnad and or somewhere near Bhawalnager ( Not sure) …Now there is a story just waiting to be told. I am amazed and intrigued by these write ups of yours, simply because I have a very strong attachment to the sea. The picture of the bell of the Sindhi Lightship is brilliant. The lightship was later replaced by the Sindhi buoy which was difficult to keep in place especially in the monsoons and it too disappeared. You say that the Cape Monze light is not visible from Karachi but that’s not so, because on a clear day it is clearly visible and at night you can see it flashing from Manora or Sandspit. Do keep writing and posting pictures. Well done ! WE must preserve our heritage and bequeath it to our children Thats our least duty. I used to Scuba Dive in this area since 1980, but unfortunately access to Cape Monze was blocked by the Navy about 15 years ago. The other route is from Mubarak Village but you need a four wheel drive. This is one of the most beautiful drives near Karachi, hardly one and a half hours to Cape Monze. Beyond Cape Monze the beach is excellent for camping. I hope that with this write-up access to public is restored by the Navy. One of them LS-111 was washed ashore in a storm and scrapped. Her Fog Signal Bell and Builders Plate were salvaged as artifacts. We recently came across a photo of her Fog Signal Bell on display at the base of a Lighthouse near Montevideo, Uruguay. We are still searching for a photo of her Builders Plate. You can now see our delight when we read of your successful find. Mr. Mulki, I’m requesting permission to reprint your story on our Web Site, so we can share it with other Lightship Sailors, family and friends. We appreciate any consideration, you give to us. Thanks again, for an outstanding story and successful find. Thank you, very much for your kind words. I am glad that you enjoyed the story. Being a lightship sailor and researcher yourself, the subject was undoubtedly familiar territory for you. Thank you, for your interest in my work – I’m truly honored.